Build a directory of favourite numbers that can be speed dialled from your handset. 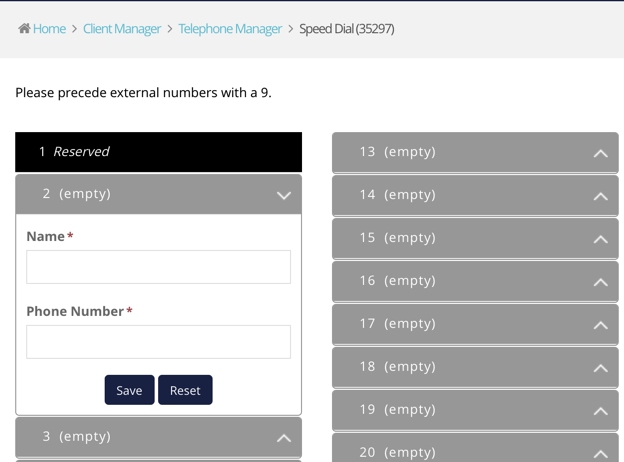 To create a Speed Dial directory, Select the relevant number in Telephone Manager, select 'Directories', and choose 'Speed Dial'. Select an empty slot. Enter a name into the 'Name' field, and an extension or an external number (preceded by a 9) into the 'Phone Number' field. The number of the slot will be the number you dial when ringing these numbers. On your telephone keypad, dial #, then the associated number to call the speed dial. For example, if you entered an extension into speed dial 2 (shown in the screenshot above), you would dial #02.